When it became clear last fall that the CIA's now discredited Benghazi talking points were flawed, the White House said repeatedly the documents were put together almost entirely by the intelligence community, but White House documents reviewed by Congress suggest a different story. ABC News has obtained 12 different versions of the talking points that show they were extensively edited as they evolved from the drafts first written entirely by the CIA to the final version distributed to Congress and to U.S. Ambassador to the U.N. Susan Rice before sheappeared on five talk shows the Sunday after that attack. White House emails reviewed by ABC News suggest the edits were made with extensive input from the State Department. The edits included requests from the State Department that references to the Al Qaeda-affiliated group Ansar al-Sharia be deleted as well references to CIA warnings about terrorist threats in Benghazi in the months preceding the attack. That would appear to directly contradict what White House Press Secretary Jay Carney said about the talking points in November. "Those talking points originated from the intelligence community. They reflect the IC's best assessments of what they thought had happened," Carney told reporters at the White House press briefing on November 28, 2012. "The White House and the State Department have made clear that the single adjustment that was made to those talking points by either of those two institutions were changing the word 'consulate' to 'diplomatic facility' because 'consulate' was inaccurate." Summaries of White House and State Department emails — some of which were first published by Stephen Hayes of the Weekly Standard — show that the State Department had extensive input into the editing of the talking points. 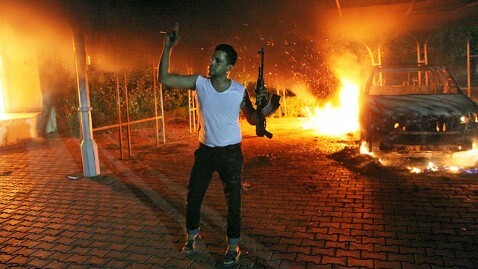 "The Agency has produced numerous pieces on the threat of extremists linked to al-Qa'ida in Benghazi and eastern Libya. These noted that, since April, there have been at least five other attacks against foreign interests in Benghazi by unidentified assailants, including the June attack against the British Ambassador's convoy. We cannot rule out the individuals has previously surveilled the U.S. facilities, also contributing to the efficacy of the attacks." In an email to officials at the White House and the intelligence agencies, State Department spokesman Victoria Nuland took issue with including that information because it "could be abused by members [of Congress] to beat up the State Department for not paying attention to warnings, so why would we want to feed that either? Concerned …"
The paragraph was entirely deleted. Like the final version used by Ambassador Rice on the Sunday shows, the CIA's first drafts said the attack appeared to have been "spontaneously inspired by the protests at the U.S. Embassy in Cairo" but the CIA version went on to say, "That being said, we do know that Islamic extremists with ties to al-Qa'ida participated in the attack." The draft went on to specifically name the al Qaeda-affiliated group named Ansar al-Sharia. Once again, Nuland objected to naming the terrorist groups because "we don't want to prejudice the investigation." In response, an NSC staffer coordinating the review of the talking points wrote back to Nuland, "The FBI did not have major concerns with the points and offered only a couple minor suggestions." After the talking points were edited slightly to address Nuland's concerns, she responded that changes did not go far enough. "These changes don't resolve all of my issues or those of my buildings leadership," Nuland wrote. In an email dated 9/14/12 at 9:34 p.m. — three days after the attack and two days before Ambassador Rice appeared on the Sunday shows – Deputy National Security Advisor Ben Rhodes wrote an email saying the State Department's concerns needed to be addressed. "We must make sure that the talking points reflect all agency equities, including those of the State Department, and we don't want to undermine the FBI investigation. We thus will work through the talking points tomorrow morning at the Deputies Committee meeting." After that meeting, which took place Saturday morning at the White House, the CIA drafted the final version of the talking points – deleting all references to al Qaeda and to the security warnings in Benghazi prior to the attack. White House Press Secretary Jay Carney said none of this contradicts what he said about the talking points because ultimately all versions were actually written and signed-off by the CIA. "The CIA drafted these talking points and redrafted these talking points," Carney said. "The fact that there are inputs is always the case in a process like this, but the only edits made by anyone here at the White House were stylistic and nonsubstantive. They corrected the description of the building or the facility in Benghazi from consulate to diplomatic facility and the like. And ultimately, this all has been discussed and reviewed and provided in enormous levels of detail by the administration to Congressional investigators, and the attempt to politicize the talking points, again, is part of an effort to, you know, chase after what isn't the substance here." UPDATE: A source familiar with the White House emails on the Benghazi talking point revisions say that State Department spokesman Victoria Nuland was raising two concerns about the CIA's first version of talking points, which were going to be sent to Congress: 1) The talking points went further than what she was allowed to say about the attack during her state department briefings; and, 2) she believed the CIA was attempting to exonerate itself at the State Department's expense by suggesting CIA warnings about the security situation were ignored. In one email, Nuland asked, why are we suggest Congress "start making assertions to the media [about the al Qaeda connection] that we ourselves are not making because we don't want to prejudice the investigation?" One other point: The significant edits – deleting references to al Qaeda and the CIA's warnings – came after a White House meeting on the Saturday before Ambassador Susan Rice appeared on five Sunday shows. Nuland, a 30-year foreign service veteran who has served under Democratic and Republican Secretaries of State, was not at that meeting and played no direct role in preparing Rice for her interviews.